Astrophysics is a discipline where much of the time we are studying light emitted billions of years ago from stars that may now be long-dead. So it is always exciting to be able to announce breaking news. 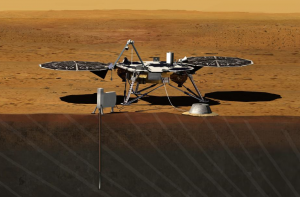 Today NASA approved a $425 million mission called InSight, designed to explore Mars’ crust and interior. The mission will have four instruments. One will determine Mars’ rotation axis. A second will be comprised of a robotic arm and cameras to deploy and monitor other instruments on the surface. A third will measure seismic waves through Mars’ interior, and a fourth will measure heat flow from the interior. Given the recent Curiosity rover sent to Mars, you might wonder why we need to do more missions to Mars. What else can we learn? Well, a lot, as it turns out. Probing below the red giant’s surface will give us insight (sorry, NASA naming makes punning so easy!) into Mar’s history and in the process likely shed light on our own Earth’s formation as well. Mars is actually more similar to the Earth than you’d think—despite its size and much lighter composition, it would have undergone the same processes as the Earth did during its evolution, such as separation of the crust, mantle and core. But, why bother going to Mars? Surely we have easily accessible information on these processes closer to home, by studying Earth? Mars, however, has been much less geologically active than Earth over its history, so it preserves a more legible and complete record of these formative processes than Earth does. Let me offer a little more detail on the kind of processes that Mars will tell us about. All terrestrial planets have similar structures, with three parts: a core, a mantle, and a crust. These planets got to be this way through melting and differentiation, both processes that we don’t know much about at present. Differentiation is when the molten outer portions of a planet cool and crystallize, with lighter minerals rising to the surface and heavier minerals sinking to produce the mantle. The heaviest elements present, iron and nickel, sink to form a metallic core—incidentally, it is this that is thought to be responsible for the Earth’s magnetic field. Many properties of a planet today, such as composition of surface rocks, level of volcanic activity, and presence or absence of a magnetic field, depend on the early evolutionary history of these processes. Insight will study things like crust thickness, core size and density, and mantle density and stratification today to determine what this history was. The mission will be short but sweet, launching in March 2016, landing in September with first results in October, and remaining active until September 2018. How long is that? 720 days, but, if you want to sound really in the know, don’t say that. Say 700 sols, which is the mission’s length in Martian days. Each sol is 37 minutes and 22 seconds longer than an Earth day, and there are 668 of them in a Martian year. So, next time someone asks how long it will take to finish your PhD, impress them by saying it will only take 2 or so Martian years! Of course, time ticks faster on Mars because it is not as deep in the gravitational potential well of the Sun as is Earth, but then, Earth is traveling faster around the Sun than Mars, so Special Relativity will produce some time dilation with the opposite sign. But, if the person who asked about your PhD points this out, you might be dealing with someone who will be perfectly unphased by a completion time quoted in sols!